Nobody wants smelly bins near their home! Dirty wheelie bins give off offensive smells and can be a breeding ground for germs and bacteria responsible for food poisoning. Flies, maggots and other vermin are also common in neglected wheelie bins. The health of your family is important to you! Helping you to keep the sanitation of your wheelie bins is important to us. Here at Finerclean we want to help you protect your family by making sure your wheelie bins remains sanitized and bacteria free. Cleaning your bin is a filthy, smelly chore! Why not let somebody else do it for you? Now it is easy to keep your wheelie bins clean, fresh and disease free with Finerclean; banishing the fear of what’s lurking in your wheelie bin! Let Finerclean’s technicians take care of it! 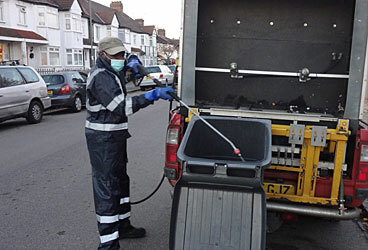 We will come and pick up your wheelie bins once every 2-4 weeks, on the day of wheelie bin pick up, where they will clean and sanitize your wheelie bin before you or anyone in your family can come in contact with them & nasty bacteria. bio-degradable sanitizers and cleansers. Decrease the spread of disease and bacteria today. Sign up now, and “love your wheelie bin”!